A few weeks back, I learnt that a mandala is a circular drawing used in practices like mediation. I was encouraged to create one in response to a challenge I face. Here is my mandala called ‘Acceptance’. It’s supposed to depict a snowflake bleeding out into a collection of eucalyptus leaves and golden sand. My challenge? Embracing the here and now. It’s going to be another balmy 37ºC in Melbourne today. The hot weather can be a bit of challenge when I’m working on a hand illustration. I have to weigh things down so the fan doesn’t blow everything away. I layer paper towels under my hands on the illustration as I go so that my sweat doesn’t deform the paper. I also find that the light shining through the windows can be painfully bright during the day. Keeping the blinds down and drawing in the semi-darkness is not a great option. My solution? Putting on my pair of red indoor sunnies (Australian for sunglasses). Now I’m ready to draw. I read a Canadian opinion piece a few weeks back debating the merits of wearing thermals versus snow pants in the city. The main argument seemed to be that snow pants aren’t as professional as thermals, which can be hidden under more formal wear. I don’t know, I think you can still look pretty dapper in snow pants. The added advantage is that, once you’re indoors in a heated environment, snow pants are much easier to take off. For everyone braving cold winter weather in the Northern hemisphere, here is ‘Thermals vs Snow Pants’. I’ll let you decide. 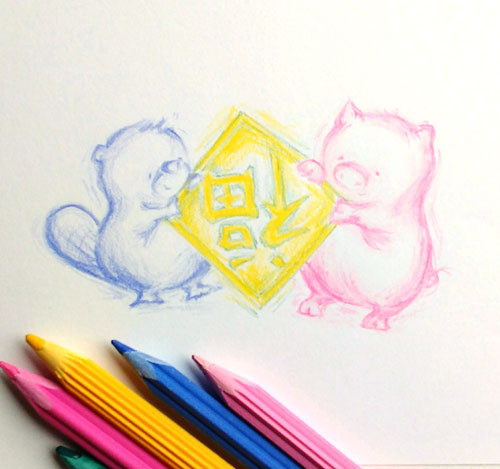 To ring in the Year of the Pig, here is a little sketch I did using a set of five flower pencils (i.e., pencils with cross-sections featuring a bellflower, evergreen, dandelion, red plum, and cherry blossom) I received as a gift last month. Thank you Hubert and Cecilia! For me, this will also be the Year of the Beaver as I work to complete my next picture book over the next months. Wishing everyone good health, happiness, and fortune for the year ahead! Woah indeed! A big shout out to Mathieu Lafabrie, whose French translation of ‘Simone in Australia’ (Simone en Australie) is now available on shelves in the Language Book Centre of Abbey’s Bookshop in Sydney. Mathieu and his wife, Alexandra, are also the travel and wildlife authors/photographers of Petit Parc autour du monde and the upcoming The Giraffe and The Grizzly. Follow their work to get inspired and informed! Every year, I try to create a new design and send it out as Christmas cards to family and friends. Unfortunately, this season has been a little too hectic for that, but I’ve managed to complete my design today, just in time to wish everyone a very Merry Christmas and Happy New Year. Hurrah! Here is ‘Holiday Indulgence’, featuring a kangaroo enjoying an Australian wreath. May you all indulge in the things you love most this holiday season. I was honoured to be asked, for a third year in a row, to create a holiday design for Echidna Giving. It is a wonderful organisation that focuses on bringing quality education to girls living in lower-income countries. I’ve sent off the latest design but thought I’d share my design from last year. This one was created while I was visiting friends in Edmonton. Thank goodness I was staying with a creative spirit who had everything I needed on hand. Thanks again Athena! Hope everyone is gearing up for a fantastic holiday season! I know Canadian Thanksgiving has passed but I was in the mood for a bit of arts and crafts and had a flashback to elementary school. I don’t know if this is still a popular Thanksgiving activity in art class but I remember making paper turkeys using our hand prints. Here is my updated version using a sheet of paper, a pair of scissors, coloured pencils, white glue, and two traces of my left hand. I had to get creative with the feather patterns since I didn’t have any construction paper. The first hand trace formed the base of the turkey - the head, body and large tail feathers. The second hand trace was cut into six pieces. The five finger pieces formed the second layer of tail feathers and the palm became the wing. An extra thumb trace created the fleshy wattle on the neck. A corner of the sheet of the paper became the beak. Now I have a turkey for next Thanksgiving. Gobble, gobble, gobble! It’s been awhile since my last post as I’ve starting doing some instructional and multimedia design work. Finding the time (and energy) to work on my next picture book has been a bit harder but I will find a balance soon. Fingers crossed! In the meantime, you might remember this moose from a music poster I did some time ago. I quite like this moose so decided to give him centre stage in his own print. As the title says, here is a moose in a canoe. I'm thrilled to announce that my Simone books are now at Hill of Content Bookshop, located in the Melbourne city centre. They have a beautiful range of books that aren't just for kids. On the topic of children's picture books, I recently read a story/article that looked at the top 100 selling picture books in Australia. Titled Bear Finds A Voice, I thought this was an interesting read highlighting gender balance in these top sellers. While I was away overseas for the last month, I completely unplugged - no phone, email, or online news - and it was absolute bliss! 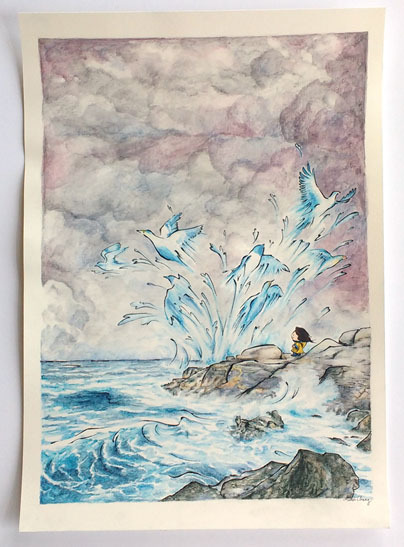 Now that I've returned and am getting back into the swing of things, I discovered that the story I am working on was shortlisted and highly commended in the Illustrations: Illustrated Picture Books category at this year's Children's and Young Adult Writers and Illustrators (CYA) Conference. Here's the main character from that work-in-progress dancing a celebratory jig. A very belated thank you to everyone at CYA! I've been doing a lot of writing this past month as I've started the preliminary manuscript for a space themed story. It's time to switch back into illustration mode though so I'm warming up with some sketches of landscapes that will feature in a different book that's set in the Rockies. The colours aren't quite right but experimentation is all part of the illustration design process. The French translation of Simone in Australia is finally here! Simone en Australie was only made possible by the wonderful Mathieu Lafabrie. As a thank you for his beautiful translation, I will donate all profits from this book to support Australian wildlife conservation on his behalf. We are still in the process of choosing an organisation/program to donate to and will announce where the profits will go later this year. Simone en Australie was my first foray into print-on-demand (POD), meaning she is now available online through sites like Amazon.ca, Book Depository, Booko, etc. Simone in Australia and Simone in France have followed suit. Larger print versions of Christophe's Crumbs and Les Miettes de Christophe through POD are coming soon. I've spent the last few months uploading my books onto print-on-demand (POD). I've previously done offset printing (i.e., printing locally and self-distributing) but with the upcoming release of Simone en Australie, I decided to try POD to make the book more accessible to French readers across and outside of Australia. I have mixed feelings about POD but will share my thoughts about it in my next post. Until then, in anticipation for Simone en Australie, I've created a new set of Australian wildlife postcards featuring a mix of familiar and lesser known creatures that include the koala, Tasmanian devil, wombat, cassowary, playtpus, thorny devil, pygmy rock-wallaby, and lyrebird. You can check out the whole set here. Today was the first time I presented as a writer and illustrator of picture books at a secondary school. My presentation included a short talk of how I make picture books and a follow-along activity demonstrating the techniques I use to create an illustration. Here you can see how I built up an emu and a cassowary. Starting with some basic shapes (ovals, triangles, and lines) to form the outline of the birds, I added distinguishing features to differentiate between the two using reference images (e.g., the cassowary has a big casque on its head and extra neck skin similar to a turkey), applied shading or hatching to give the birds some greater definition, and finally, introduced a bit of colour to make them pop. The highlight for me was to hear some of the students be so surprised that they could draw some pretty amazing birds by the end of the activity. It just shows that we can all draw. Thanks so much to Ms. Yoon, her teaching colleagues, and their year 7 students for being so welcoming and enthusiastic. I wish them all the very best as they put together their own picture books. I haven't spent enough time in Paris to think of it as a place that has shaped me. It does hold a special place in my heart though. Paris is where my husband spent two years working while I was studying in Melbourne. During that time, if I couldn't be in the same city/country/continent, I hoped that he would be surrounded by good people who'd look out for him. Paris turned out to be just that and so much more. The people he met were warm and funny, patiently helped him become semi-fluent in French (from speaking none! ), and made Paris feel like a second home. They made Paris the City of Lights for us. This is a small stippling I did while taking a break from writing earlier this week. I was saddened by the news of Sudan, the last male northern white rhino's, passing. Having collected his genetic material, hopefully conservationists will be successful in preserving this subspecies with IVF techniques. Another place that shaped me was Halifax, Nova Scotia. It is my city of firsts: the first city I moved to away from any family and friends, where I experienced my first hurricane and Atlantic snowstorm, and the first time I realised that I could stand on my own. It was a tumultuous but invigorating time. I don't think I ever felt alone in Halifax, thanks to the love from back home and great cheer from the incredible people I met there. I allude to some Atlantic seabirds in this illustration: the puffin, osprey, little auk, eider duck, double-crested cormorant, black-headed gull, and American golden plover. There's a column in the travel section of The Age newspaper where different people (scientists, athletes, writers, architects, etc.) list five places that made them. In that same vein, this is a follow-up to my Durham illustration. Here is Melbourne, my city of extremes, where I have experienced some of the best and worst moments in my life thus far. This illustration features the beautiful stained glass pattern by the late Leonard French, that spans the ceiling of the Great Hall in the National Gallery of Victoria.